The word “library” doesn’t immediately conjure up a sense of coolness but these libraries are much more than just book storage depots. From public archives of knowledge to centers of learning at colleges and universities, libraries can be amazing places – so why shouldn’t they look the part? 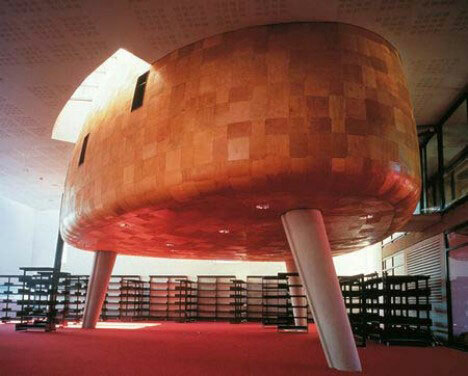 From alien blob monster buildings to futuristic steel-and-glass mega-structures, here fifteen libraries that prove books can be very cool. 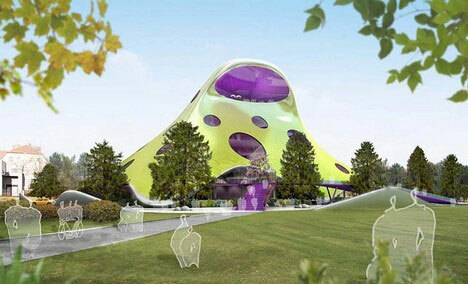 The new national library of the Czech Republic is still in its initial design stages but from the look of the plans, it’s anything but bookish. 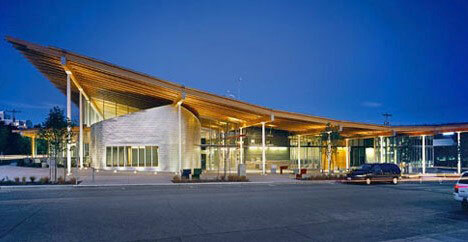 Materials to be used include unpolished white marble, mirror-finished stainless steel and an abundance of new greenery. 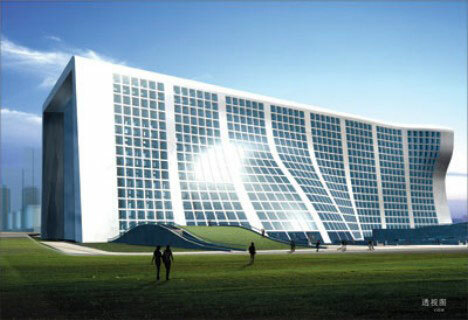 A three dimensional construct for the third millennium, the library will have a working capacity of 10 million volumes when completed. Set on the edge of the huge Letna Park in Prague, the library is said to be democratic architecture in a democratic state, as Czechs express long-suppressed desires for freedom of thought that are uniquely suited to the concept of a library. 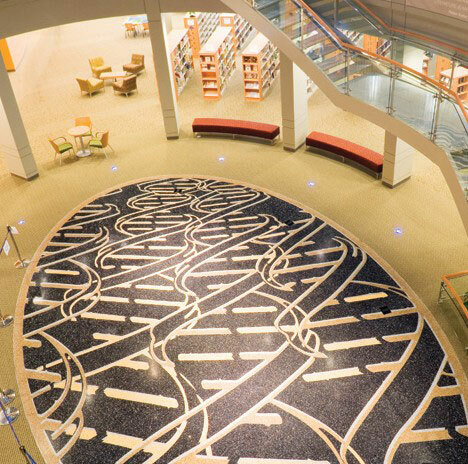 Libraries are often funded by governments, corporations or through university endowment funds that provide architects with plenty of green with which to grow their visionary ideas. 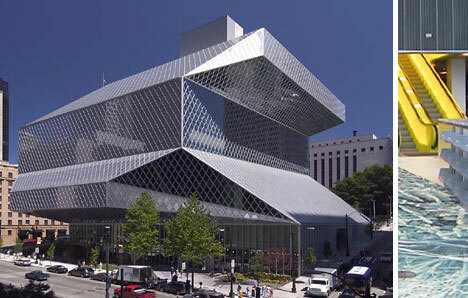 Case in point: the Seattle Public Library’s Central Library that dominates the corner of Madison and Fourth Street. 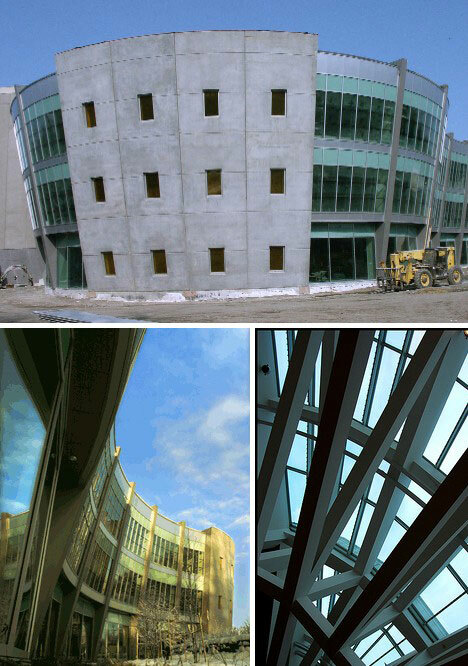 Opened on May 23, 2004, the library was constructed using 18,400 cubic yards of poured concrete, enough glass to cover 5½ football fields and 4,644 tons of steel – enough (by weight) to build 20 copies of the Statue of Liberty. 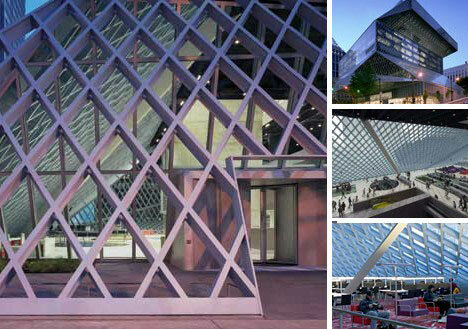 Seattle has a thing for cool libraries, it seems. The Ballard Library is a public project that stresses green design features without compromising convenience and accessibility for book readers. 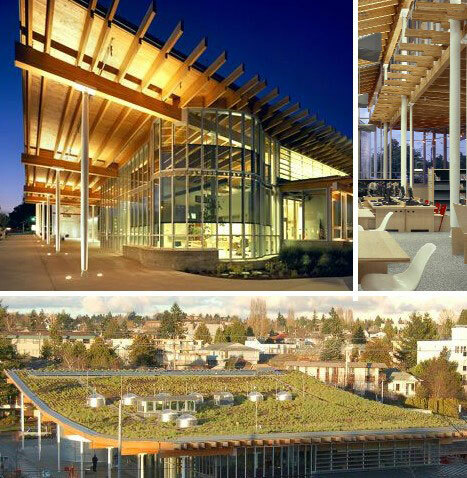 Built in 2005 at a cost of just under $11 million, the Ballard Library features an innovative “green roof” consisting of native grasses and sedums planted 4 to 6 inches deep in a custom growing medium topped with a biodegradable coconut fiber mat. One variation of the classic library is the personal library, of which Jay Walker has the penultimate version. 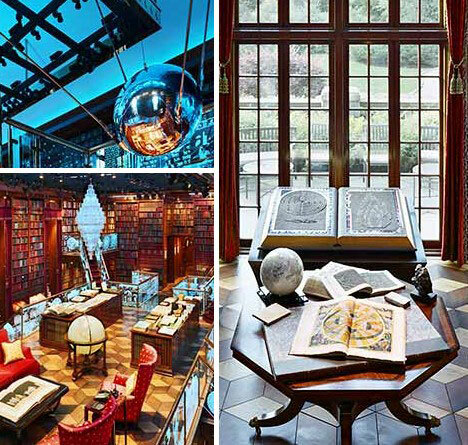 Walker’s exquisite bibliothèque takes pride of place at his New England home and hosts truly incredible items that include a Saturn V rocket instruction manual, FDR’s plan (scribbled on a napkin) to win World War II and a bevy of invaluable tomes encrusted with precious gems. Walker’s library holds much more than books, however. 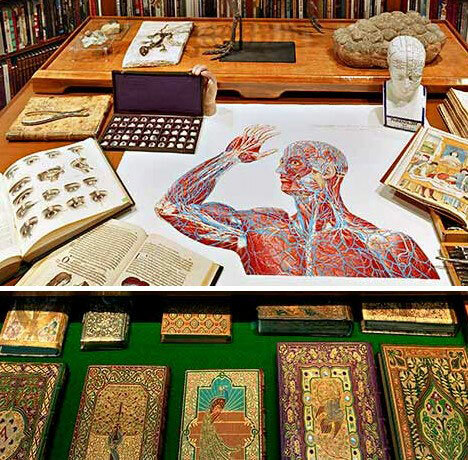 The 52-year-old Internet entrepreneur and founder of Walker Digital has accumulated some of the most exceptional objects in history to complement his book collection. Of special significance are a back-up Sputnik-1 satellite, a Nazi Enigma code machine and an original hand of The Addams Family’s “Thing”, signed by the show’s cast. The Consortium Library at the University of Alaska Anchorage is designed to take the heat off students sitting next to its windows. Yes, even in Alaska! The washtub shape reflects direct sunlight downward while still admitting ambient light. China also sees the need to expand and update its libraries to meet the demands of a growing, better-educated population. The Baiyun Mountain of Books may have an odd name… but it also has an odd appearance to match. 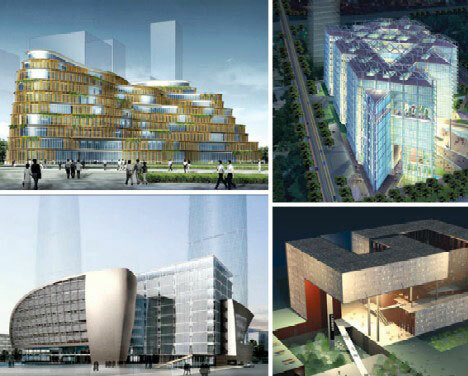 Above are a sampling of some other cool library designs that are still on the drawing board but, as witnessed at the 2008 Beijing Summer Olympics, have a very good chance of being built. 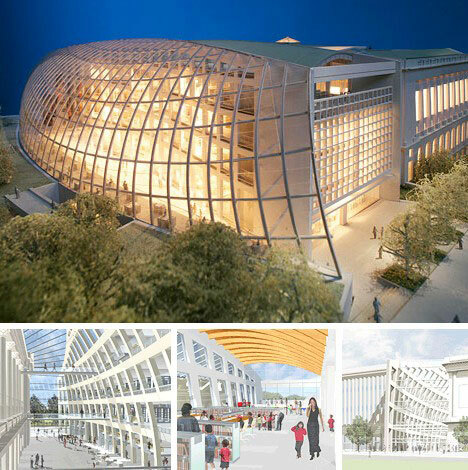 This is the bright and optimistic design for Philadelphia’s Parkway Central Library, planned by the architectural firm of Moshe Safdie and Associates, Inc., as an update & renovation to the existing Beaux-Arts library building. 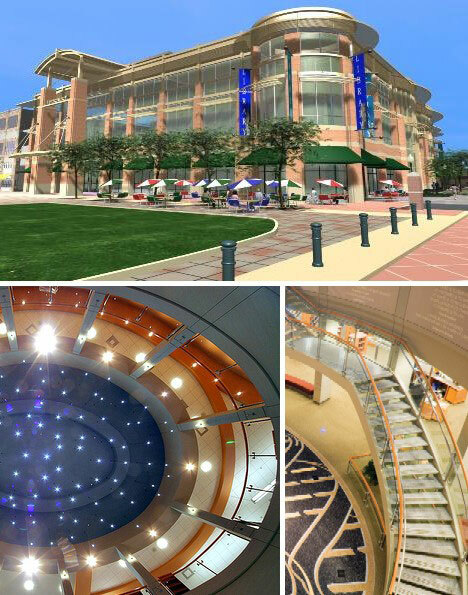 When completed, the library will offer visitors 300 public-access computers, a 550-seat public auditorium and an all-new Children’s Library which includes a Preschool Center and Craft Room. 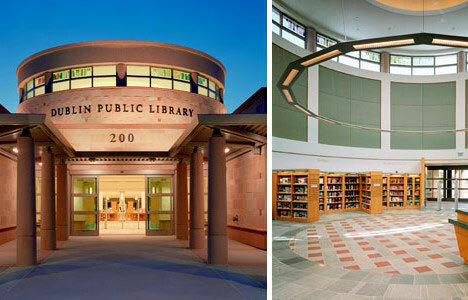 The new Dublin Civic Center Library in Dublin, CA, offers a soothing shelter from everyday worries. Designed by BSA Architects, the 38,000 square foot main building uses locally sourced materials in its construction and picks up exterior design cues from the nearby city hall. 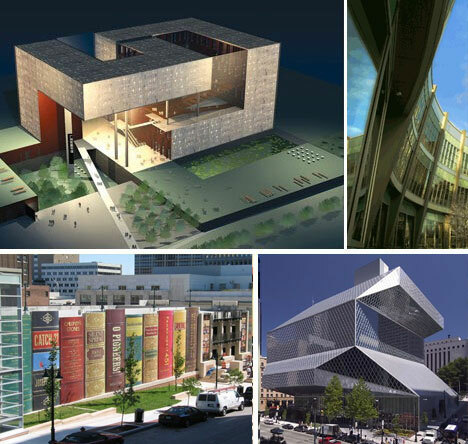 Libraries have always had a place at the heart of urban neighborhoods, and building a new library is a perfect way to revitalize a community that’s seen better days. 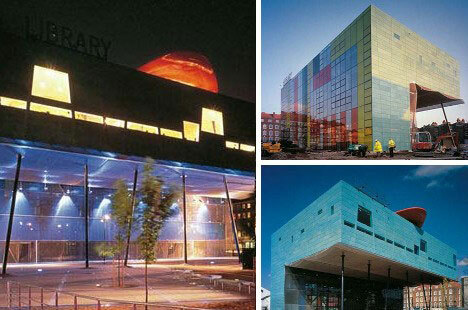 Such is the case in London, England’s Peckham Square area where the Peckham Library is located. 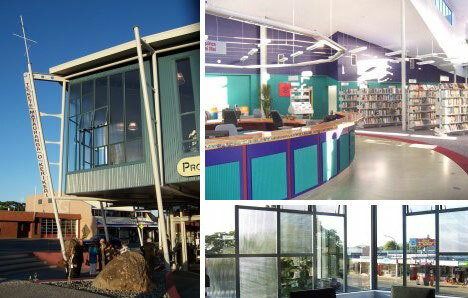 The smallish library is distinguished by its tilted “L” design supported by many narrow pillars. Inside, three wood-clad elevated tripod structures house the children’s library, an Afro-Caribbean literature center and a general meeting space. There’s another kind of library that can be very cool, regardless of one’s political slant – the presidential library. 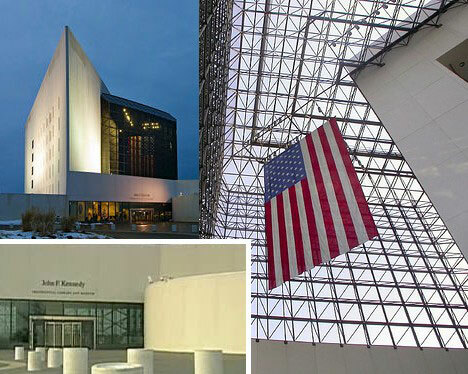 Above is the John F. Kennedy Presidential Library and Museum at Columbia point in Boston. 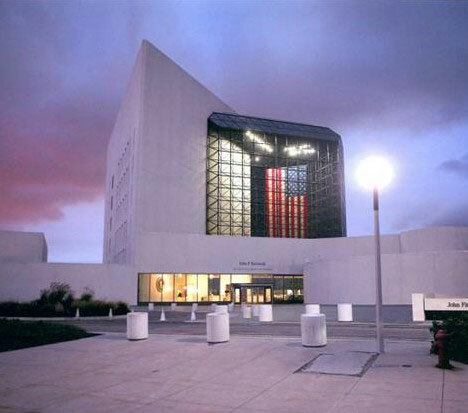 Designed by renowned modernist architect I. M. Pei, the library displays soaring lines that characterize the hopes and dreams epitomized by the all too short Kennedy presidency. The complex is situated in a sprawling, 10-acre parklike setting that provides magnificent views of Boston’s harbor and skyline. 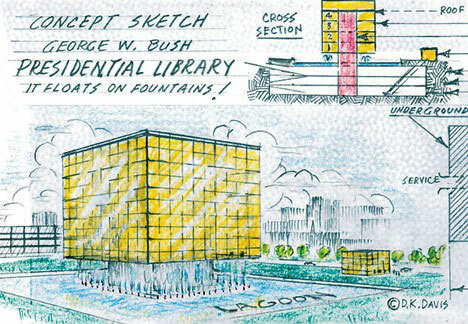 On the other hand, a satirical Back-of-the-Envelope Design Contest organized by The Chronicle of Higher Education garnered quite a few serious proposals for the George W. Bush presidential library. One of the most interesting was the above sketch depicting a cubical main building seemingly supported by water fountains. 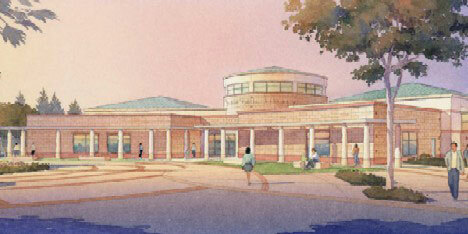 On the more practical (and less presidential) side, this is the new New Rockville, MD Library. Cool highlights include an ethereal starry night ceiling and a floating staircase. Custom Lees carpets were used through out the building, the above shot showing off the fine detail that won Commercial Carpets of America (CCA) a 2006 Design Award. 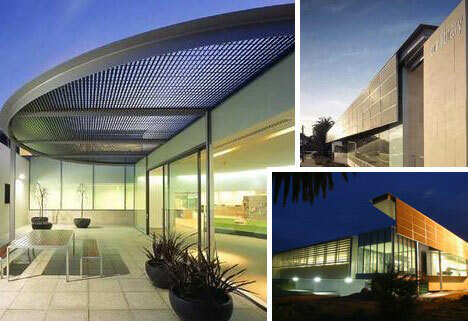 The Mornington Branch Library in Victoria, Australia, was designed by architectural firm Garner Davis to update the basic concept of a library while preserving its primary function as a neighborhood center of knowledge. The building houses approximately 50,000 books, computers and facilities to give visitors a sense of being at home. The library is also environmentally friendly, employing a perforated metal “sunshade” and double-layered walls that keep the summer’s heat out. Cool indeed! 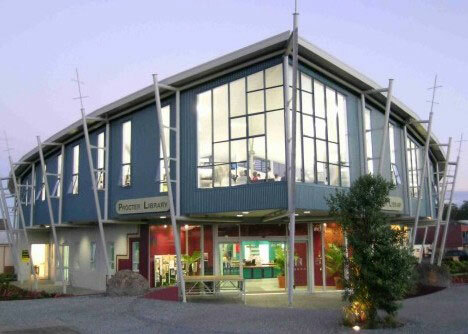 Staying down under, the Procter Library in New Zealand is also known as the Te Kete Matauranga O Kerikeri – “knowledge basket of Kerikeri” in the native Maori language. It’s a fitting name as libraries can be considered to be baskets of collected knowledge. Local architect Dianna Sandifer won a design competition for the new library and used an ancient Maori folktale as her inspiration. “A visit to the library will always involved a journey whether it is into a fictional world, into the past, present or future, into strange lands, outer space or indeed cyberspace,” says Sandifer. Maybe we can all take a page from her book!